Small electronic waste (E-Waste) can be dropped off at Residential Service Desks and at the entrance of the W.E.B. Du Bois Library in the receptacle labeled "Green Monstah". We recommend donating electronics first if they are still in good working condition. For larger items, such as nonworking mini fridges or computer monitors, please check the Office of Waste Management's Recycling of Other Materials list. Electronics contain toxic metals such as mercury, cadmium, nickel and lithium. These toxins can leach out of landfills and into the environment, so it's important to recycle them properly. 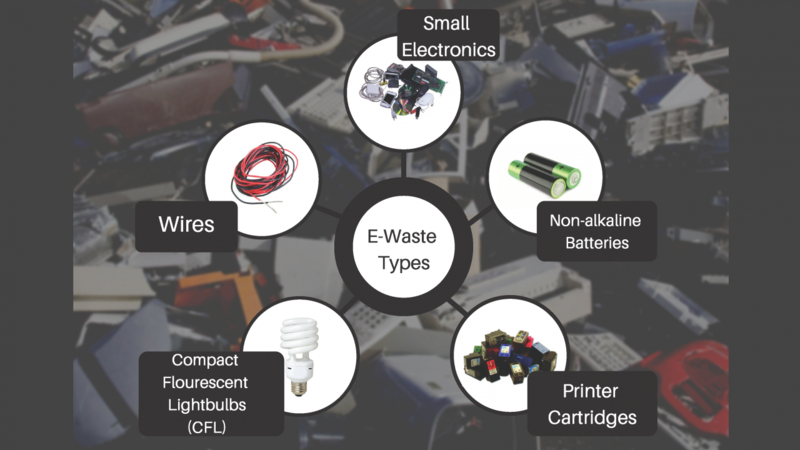 What types of E-Waste can I drop off? Why aren't all batteries accepted? We only accept non-alkaline batteries (containing Mercury, Cadmium, Nickel-Metal Hydride and/or Lithium) at E-Waste collection locations. Make sure you read the label on your batteries before dropping them off! Alkaline batteries are NOT accepted at any E-Waste collection locations. Why aren't all light bulbs accepted? We only accept Compact Florescent Light Bulbs (CFL) because they contain mercury. Incandescent and Light Emitting Diode (LED) bulbs do not contain mercury, and NOT accepted at any E-Waste collection locations. We recommend switching out your CFL bulbs for LED bulbs, because LED's are the most energy efficient and do not contain mercury.